In the comments of another post Chrissie asked for recommendations for her 19 month old son. We used to have this toy and the kids loved it. It is a rather loud toy, what with all that hammering of wood on wood, but my boys all loved it. Especially if I was willing to sit across the room and roll the balls back to them after they came shooting out the hole. 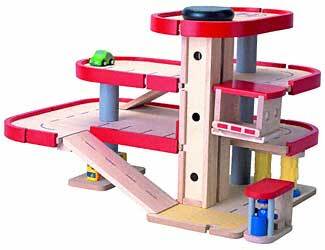 It sells for $14.95 on the Plan Toys website. And like I mentioned in the previous post, I am a huge Plan Toys fan. I don’t have my own photo of this toy because it is wrapped up waiting for Miles. I had seen Plan toys online and liked them, but never really looked at them in person. Last week I went to the small specialty toy store specifically to look at this little garage. It was so nice and so well made. All the little kids at the store were excited to play with it. We are strongly committed to manufacturing fine-quality and safe educational toys under environment-friendly conditions. The timber we use is plantation rubberwood (Hevea Brasiliensis), which is recovered from old rubber trees after they no longer generate latex and are due for burning. We process and kiln-dry the timber, in a chemical-free environment. How can you not want to support a company like this? It makes you feel all warm and fuzzy. 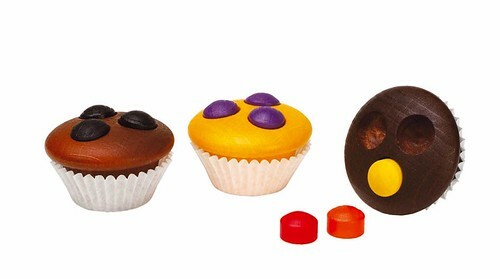 Erzi Wooden Cupcakes are one of the play food items I purchased to give my almost 3 and 4 yr olds for Christmas. When they came in the mail I of course took them out to inspect them. They are absolutely adorable. Definitely not for houses with small children who still put things in their mouths since the little gumdrops on the top come off. But for slightly older kids who like to have tea parties, these are sure to be a hit. eeBoo uses only the original art of well-known and well-loved children’s book illustrators to create completely original and vibrant toys and gifts with a classic fair. 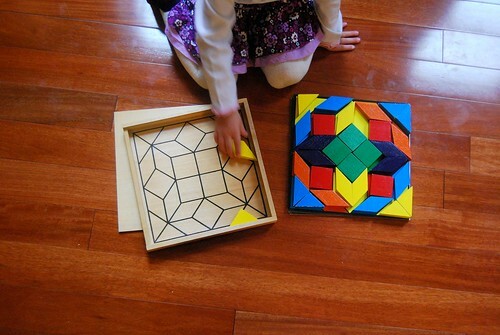 A pattern block set. All wood pieces, sturdy cardboard pattern cards, and a nice wooden box to keep it all stored together. 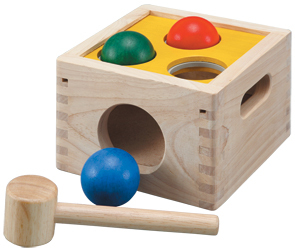 This is a great little game for the preschooler set. 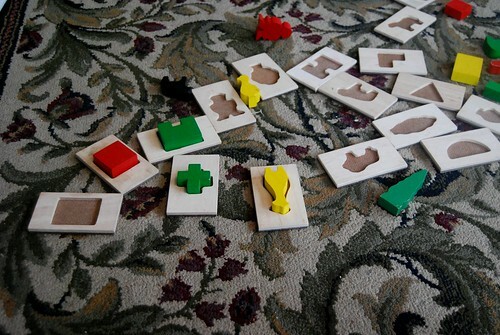 There are twenty tiles with matching wooden shapes. For the younger age range I lay the tiles out and they try to find the pieces to match. For the slightly older one I’ll lay the tiles out one at a time, but put all of the wooden pieces inside the cloth bag. Then they reach into the cloth bag and try to figure out just by touching which piece belongs to the individual tiles. 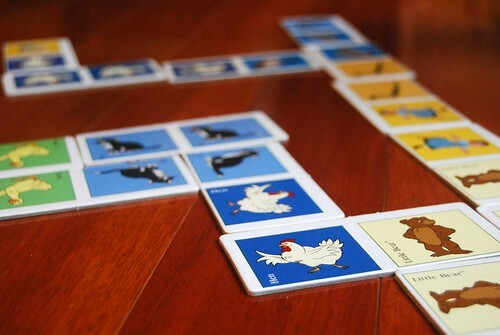 Dominos are easy for even the littlest kids to play. My 2.5 yr old can play this with his siblings. 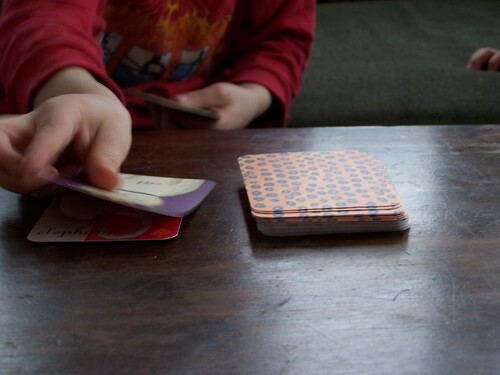 My 6 yr old will play this with his younger siblings, but I would say that this game is good for ages 2-5 yrs old. It goes quickly enough that I don’t want to gouge my eyes out when I play it either. I can’t locate Little Bear dominos, but did find a Thomas the Tank Engine set that is also made by the same company. I am so happy to discover that Community Playthings, a company I have loved for years, finally has a website. These blocks are made by a self sustaining community sort of like the Amish. I used to live near one of their communities and all the local schools, libraries, and families had their toys. (You can read about their community and business ethics on their About page. Wooden Blocks I have the Quarter School Set. Before anyone comments on the prices I have to say that these are quality heavy duty blocks, made from Northern hardwood, that will last forever. I have seen other wood block sets that are so lightweight the slightest brush against them sends tower falling down. 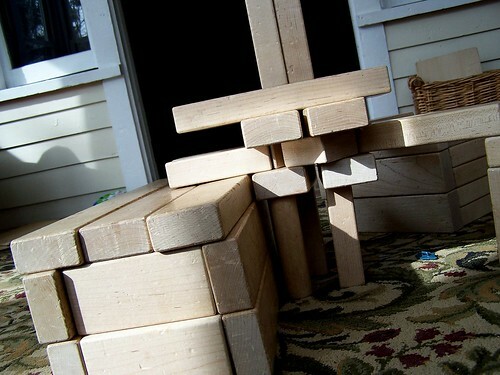 The blocks also fit together perfectly for building. From their website: The length of each wooden block unit is exactly twice the width, which is exactly twice the thickness. Their wooden trucks are amazing. The large ones are sturdy enough that kids can sit on them and ride around. We don’t own one of the large semi trucks, but a local library does and that thing has been a magnet for children for 30 years and is still going strong. I am thinking of getting my son the large semi for his birthday this year. We do have all of the village vehicles, which are nice because the kids can build roads and the vehicles are sized perfectly for driving on the block roads. 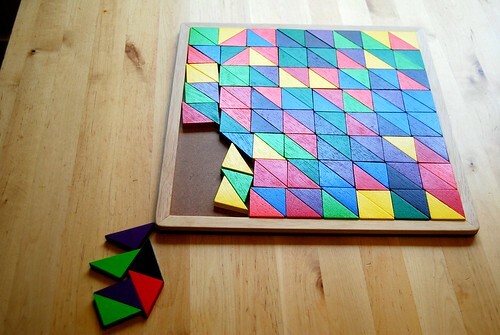 This is 128 solid wood triangular shaped pieces. I think it is sort of like piecing together a quilt. Making repeating patterns and shapes. This has been at our house for a number of years and still is in good shape and is played with on a regular basis. If it is sitting out, even my older kids will play around with it. I consider this a coffee table toy. The sort that will be played with endlessly if it is sitting out, but quickly overlooked if put away in a cupboard. It is one of my favorites. You are currently browsing the A Year Off weblog archives for November, 2007.